Ayn Rand: Conservatives' Abortion-Rights, Anti-Religion Inspiration : It's All Politics Ayn Rand, the 20th Century philosopher, wouldn't appear to be the most logical inspiration for modern-day conservative Republicans.She supported abortion, was hostile to how political conservatives combined forces with organized religion and held views that were indistinguishable from those of an atheist. 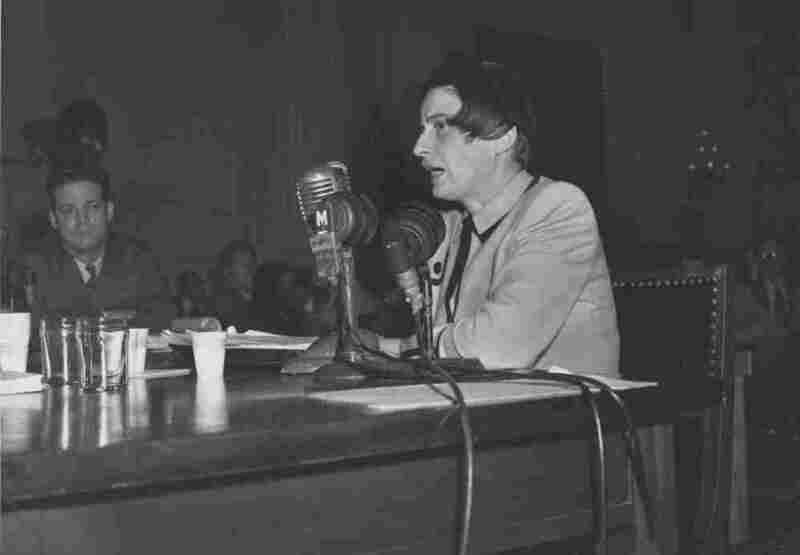 Ayn Rand testifying before the House Un-American Activities Committee, Oct. 20, 1947. Ayn Rand, the 20th Century philosopher, wouldn't appear to be the most logical inspiration for modern-day conservative Republicans. As NPR's Andrea Seabrook pointed out for the audience of Monday's installment of Morning Edition, congressional Republicans have embraced the ideas of the "objectivist" Rand who said the highest good was the happiness of the individual which could best be achieved in a society whose government imposed virtually no taxes or regulations. Rand was her own truest believer. She followed her ideas to their logical end. So she supported a lot of notions that are generally anathema to conservatives. On the Ayn Rand Institute's website, for instance, there's an FAQ which suggests just how much cherrypicking of her ideas has to be done to claim her as a modern conservative hero. She supported abortion, was hostile to how political conservatives combined forces with organized religion and held views that were indistinguishable from those of an atheist. For the record, I shall repeat what I have said many times before: I do not join or endorse any political group or movement. More specifically, I disapprove of, disagree with and have no connection with, the latest aberration of some conservatives, the so-called "hippies of the right," who attempt to snare the younger or more careless ones of my readers by claiming simultaneously to be followers of my philosophy and advocates of anarchism. Anyone offering such a combination confesses his inability to understand either. Anarchism is the most irrational, anti-intellectual notion ever spun by the concrete-bound, context-dropping, whim-worshiping fringe of the collectivist movement, where it properly belongs. Above all, do not join the wrong ideological groups or movements, in order to "do something." By "ideological" (in this context), I mean groups or movements proclaiming some vaguely generalized, undefined (and, usually, contradictory) political goals. (E.g., the Conservative Party, which subordinates reason to faith, and substitutes theocracy for capitalism; or the "libertarian" hippies, who subordinate reason to whims, and substitute anarchism for capitalism.) To join such groups means to reverse the philosophical hierarchy and to sell out fundamental principles for the sake of some superficial political action which is bound to fail. It means that you help the defeat of your ideas and the victory of your enemies. See also "Libertarianism: The Perversion of Liberty," by Peter Schwartz, in the Ayn Rand collection titled The Voice of Reason. What was Ayn Rand's view on capital punishment? She thought it was morally just, but legally dangerous—because of the possibility of jury errors which could not be rectified after the death of the innocent man. She had no position on whether there should be a death penalty or not. What was Ayn Rand's view on abortion? An embryo has no rights. Rights do not pertain to a potential, only to an actual being. A child cannot acquire any rights until it is born. The living take precedence over the not-yet-living (or the unborn). Abortion is a moral right—which should be left to the sole discretion of the woman involved; morally, nothing other than her wish in the matter is to be considered. Who can conceivably have the right to dictate to her what disposition she is to make of the functions of her own body?" Is Objectivism atheistic? What is the Objectivist attitude toward religion? They claim that they perceive a mode of being superior to your existence on this earth. The mystics of spirit call it "another dimension," which consists of denying dimensions. The mystics of muscle call it "the future," which consists of denying the present. To exist is to possess identity. What identity are they able to give to their superior realm? They keep telling you what it is not, but never tell you what it is. All their identifications consist of negating: God is that which no human mind can know, they say—and proceed to demand that you consider it knowledge—God is non-man, heaven is non-earth, soul is non-body, virtue is non-profit, A is non-A, perception is non-sensory, knowledge is non-reason. Their definitions are not acts of defining, but of wiping out. Qua religion, no—in the sense of blind belief, belief unsupported by, or contrary to, the facts of reality and the conclusions of reason. Faith, as such, is extremely detrimental to human life: it is the negation of reason. But you must remember that religion is an early form of philosophy, that the first attempts to explain the universe, to give a coherent frame of reference to man's life and a code of moral values, were made by religion, before men graduated or developed enough to have philosophy.